Sink your teeth into a prime cut at the Pittsburgh outpost of The Capital Grille. 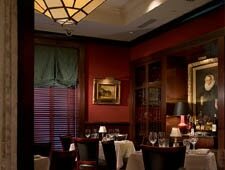 : The Capital Grille, a national chain, is known for consistently delivering a quality dining experience. The overall concept generates a comfortable environment: mahogany, leather and mounted stuffed game, including an eagle of awesome wing spread; original art centered on portraits of local notables; a lively lounge; well-appointed private rooms; and an ambitious wine program incorporating "The Generous Pour." But each site is also customized by the talents and resources of the executive chef and his or her team. Well-executed dishes distinguish the menu: premium beef, dry-aged on-site; seafood in various preparations; and such sides as truffle fries and bacon-laced Brussels sprouts. Desserts range from ice cream to flourless chocolate espresso cake.